After my failed attempt to bike to work in a pencil skirt, there is finally a fitted skirt that I CAN BIKE TO WORK IN (that I like)!! For Bike to Work Day, I wore my Bike to Work Skirt by Betabrand and I LOVE IT!! I will tell you why. But first a little story if you'll allow me to get off-topic. After getting dressed, I walked downstairs and asked my husband to take these photos. He hesitantly said, "What...is that...? A belt around the outside of your sweater?" And then, "Is it supposed to be worn like that?" I assured him that the belt was worn on the outside on purpose. [Tangent: I admit that I really don't know anything about fashion. I just wear what is comfortable for me and what makes me feel good. Because when I feel good, I feel confident. Since I am an introvert and shy around people I don't know very well, I need all the confidence I can get!] So my cardigan has a straight cut and NO shape. And I've read that for someone who has an hour glass figure I should not wear things that hide my waist or I will look like a tree trunk. Well...not exactly THOSE words but that's how I remember it. I have also read that a belt worn at the waist can cinch a shapeless sweater so I did just that! At first glance the Bike to Work Skirt looks like a fitted pencil skirt. BUT a-ha! There is a little secret--the hidden godets that allow for a wider range of movement when cycling. The low profile zippers on the seam just above each knee unzip from the hem at the knees up to the hips revealing an extra piece of fabric attached to the inside of the skirt. Another zipper is located on the side of the left hip to get in and out of the skirt. Hidden godets at the seams above the knee allow for a wider range of leg movement. With this skirt, I don't have to take dainty steps--you know, like penguins do?! The extra flap of a lighter fabric underneath allows for a wider range movement of the legs than most fitted skirts will give. I can kick my leg! I can take BIG strides! Also, there are two functional pockets in the back that are nice and deep. Approximately 5.5 inches deep (about the size of most pens). In one of back pockets there is a flag with reflective edging for those times when bicycling in low light! Betabrand Bike to Work Skirt looks great on and off the bike. I COULD NOT WAIT to get outside and start riding! And oh the JOY of pedaling with being constricted!! So I took off towards the office. The skirt is a great length and the fabric has a nice heavy weight. The material is water/soil-repellent with a very slight stretch (59% cotton 40% polyester 1% spandex). When pedaling while sitting or standing the fabric stays down and does not ride up my thighs. Still, I made sure to wear cute underwear - just in case! Before going in to the office, I had a quick detour for breakfast at the Reno Bike Project, a community bike shop that was hosting a Pancake Feed. Once I dismounted my bike, I zipped the skirt and it is once again, a fitted (although it looks just fine unzipped as well and therefore, looks more like a skirt with pleats). The only flaw I could find was the back stitching of the hem on one side went too far and prevented one of the zippers from zipping down and up easily. I will need to fix that when I get a moment. Other than that, the skirt is well made (in San Francisco, CA) and will last through many washings. I am very hard on my clothes but I definitely think this one will last at least two seasons. At $98 it can be a little pricey but the features are well worth it to me. I picked it up for $73.50 during its concept design and it needed crowdfunding to go to production. But if you can get a 10% or 20% discount code by uploading your photo to be Betabrand's model citizen! I am so glad Betabrand's graphic designer Mickey Roxas designed this skirt, which is currently offered in gray and black. I love it so much I ordered another skirt in black. 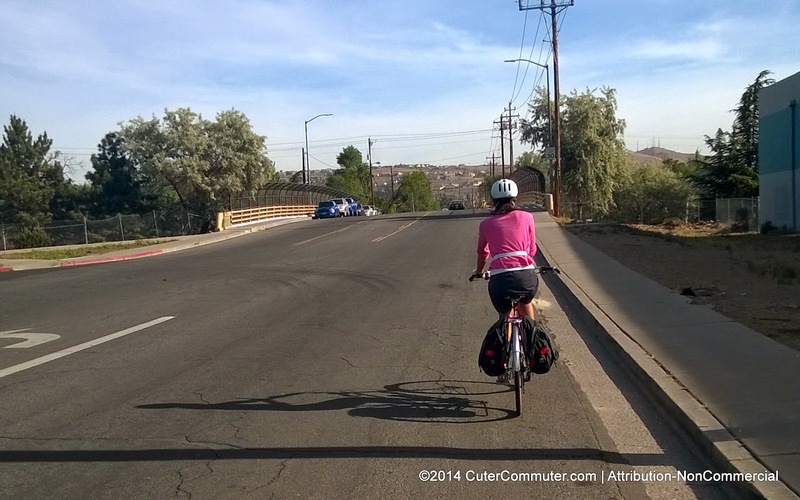 The Bike to Work commuter skirt does exactly what it is designed to do and it does it well! !